There are times when marriages end up being your typical happily ever after. Some marriages, however, fail due to certain circumstances that are negative or unfavorable. You and your spouse might find yourselves coming to an agreement about wanting to legally separate from each other. 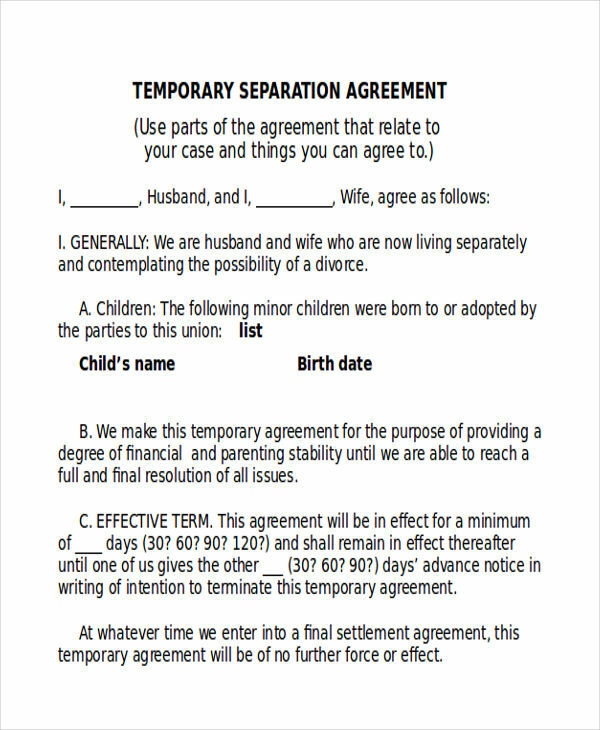 If you and your partner are currently considering getting legally separated, we have provided a few basic agreement forms for your legal separation documentation. 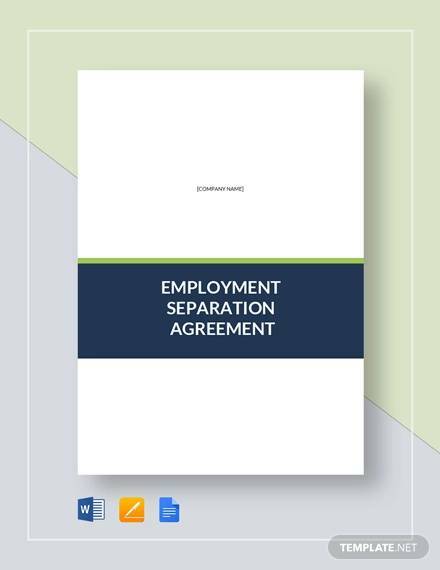 We will also leave you with some information that is going to give you a better idea of what a separation agreement is all about. 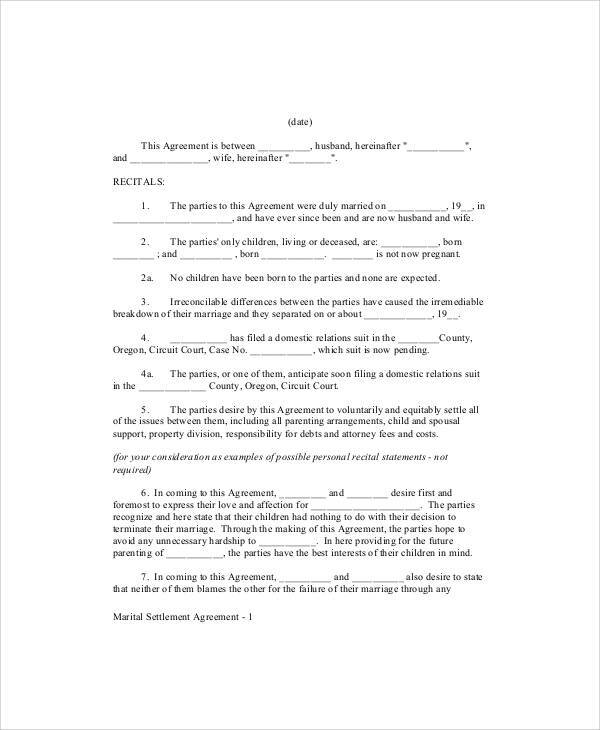 A separation agreement form is basically an agreement to every one of the issues you and your ex-spouse or soon-to-be ex-spouse need to determine before getting legally separated. 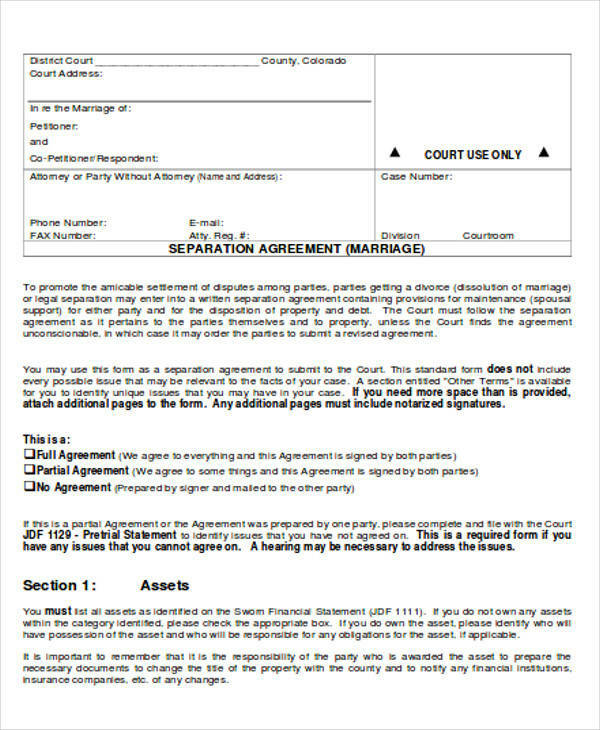 Some of the issues and matters covered by this agreement are the division of conjugal property, the custody, and support among your children if you have any, and spousal support or alimony, assuming that it is applicable. 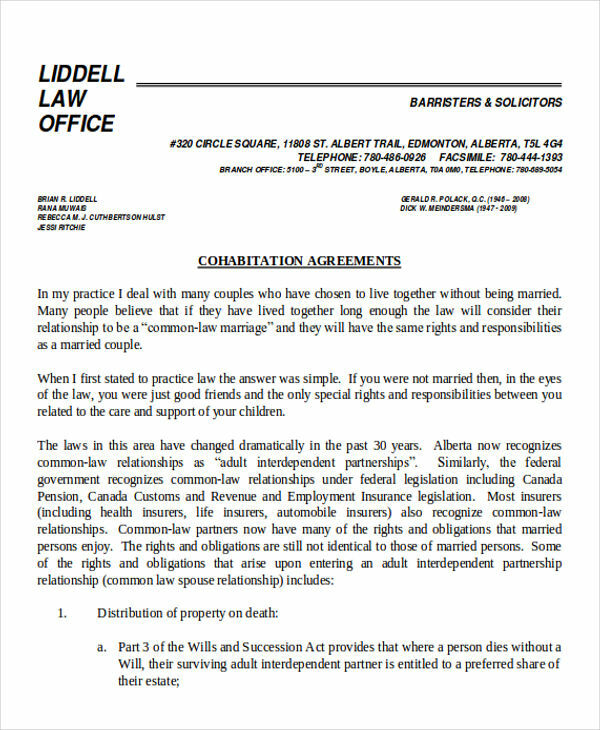 This written understanding must reflect the signatures and legally approved by both you and your spouse. 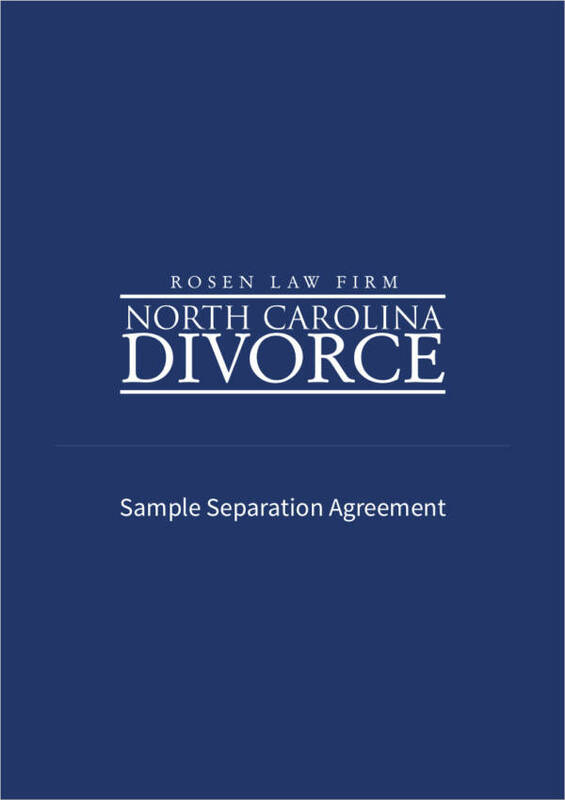 By having this agreement, both you and your spouse can choose everything and have control over the result of the separation procedures. The quick answer to that question depends on the both of you. You can both be legally separated for a long period of time or short period of time. 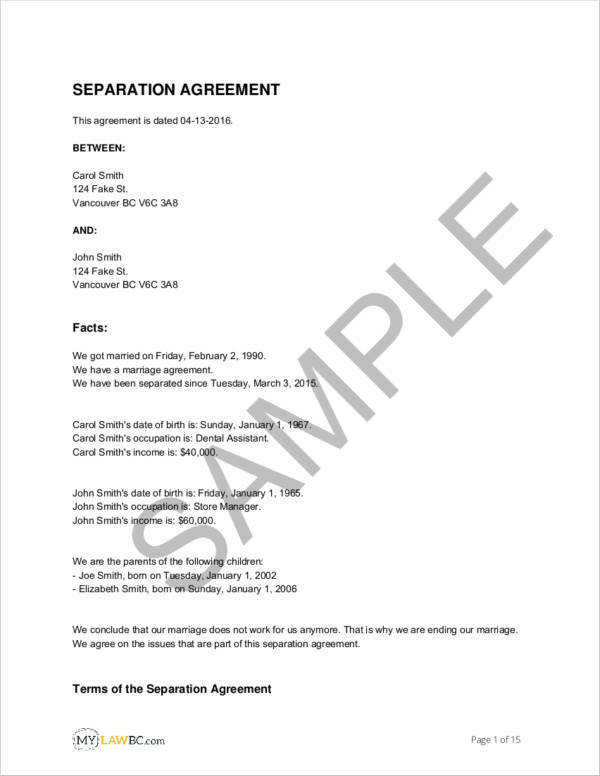 A divorce agreement only comes into the picture when one or both of you desire to get married to someone else in the future. If either of you has any plans of doing so, then legal separation would suffice. Now you may also ask if there are any pros and cons to being legally separated. To answer your question, we would like to give you quick pros and cons list with regards to legal separation. All things considered, money-related concerns seem, by all accounts, to be the greatest elements that make couples decide on whether or not they would like to stay legally separated. This is because there is a wide variety of monetary issues that affect a couple’s choice to not get divorced despite being legally separated, regardless of whether they live separately or in one house. Mortgage. Should couples opt for divorce, incurring a loss during a sale of the family house or mortgage issues will arise. This is something that is totally avoidable will be less of a burden during legal separation, which is one of the reasons why separated couples opt to stay legally separated instead of getting divorced. Health insurance. When couples remain legally separated, it ensures that both spouses are going to be continuously covered by their health insurance since they are still basically married to each other. This can obviously be a huge advantage to one of the spouses especially if a particular spouse relies on the other spouse for medical health insurance. Taxes. If couples remain legally separated as opposed to getting a divorce, it can allow them to continue to benefit from income tax advantages that are exclusive to married people only. Pension benefits. When it comes to long-term marriages of ten (10) years or more, a partner or ex-partner is usually entitled to a share of the other partner’s social security benefits. Couples who are separated and are in good terms can choose to not push through with a divorce to allow the other partner achieve or gain benefit from the ten-year threshold of the pension benefits. There are circumstances during a legal separation where the separated couple opts to stay together under one roof. However, there are implications to continue living together, so you have to make sure that you follow certain rules that can make your separation better. Establish whether or not you are planning to live together on a long-term basis or otherwise. Make use of separate bedrooms. If there is only one bedroom, one can stay in another part of the house such as the living room. Romantic intimacy or sexual intimacy is to be avoided at all times. You are not responsible for the well-being of your ex-spouse anymore. This means that you need not prepare his/her meals, provide for his/her clothing, or provide other necessities. As per the previous statement, your ex-spouse is also not responsible for any of your needs and wants. Eating meals together is optional. Make sure that the assigned spaces for each spouse are well taken care of. Each spouse is responsible for his/her own laundry. Make sure that both spouses have different checking and saving accounts. Social gatherings are to be attended as separate individuals. Giving gifts during special occasions is not necessary. If possible, two separate entrances can be made for both spouses. When questioned, be ready to answer why you and your ex-partner are still living together. When it comes to coming up with a separation agreement, it would be a good idea to finalize everything about it with an attorney present to ensure that everything is stated in a clear manner. 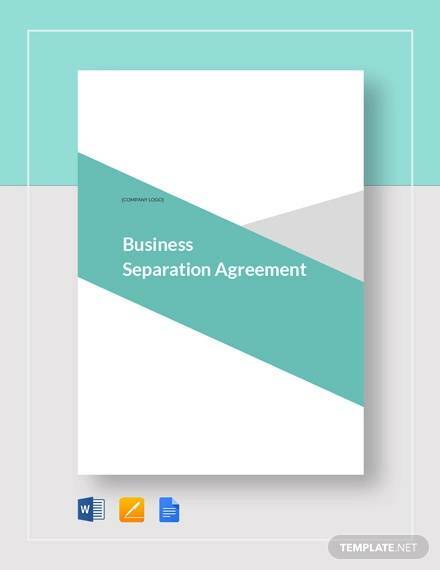 However, before you ask for the presence of a lawyer, you and the other party/parties should come to an agreement on what you would like to include in your separation agreement. 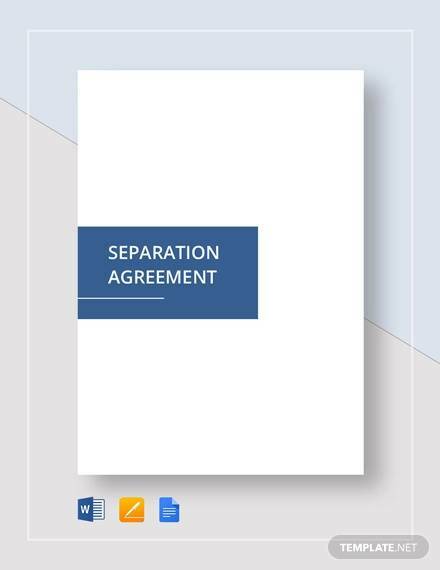 In this section, we would like to include a few steps that you can follow when it comes to coming with a well-written separation agreement. Dividing debt. When you and your spouse decide to legally separate or divorce, splitting the debt you have both incurred while you were married, take note of who is responsible for the debt as well as the person who gained benefit from the debt. Make sure to note when would be the optimal time for the debt to be paid as well. Dividing assets. When dividing assets during separation, they come with a few rules. You have to make sure that you consider the debt-to-asset ratio of each party and make sure to divide the property in a fair manner. A net worth calculator might be useful in this case. Alimony. The court may ask one partner to pay the other spousal support. Be ready for this circumstance and make sure that you will be capable to make payments should you be the one who would pay the alimony to your partner. Make sure that the amount is also reflected. Child custody. Establish who will get custody of the children once you have separated. This can either be joint or shared. You might want to check out temporary custody forms regarding this matter. 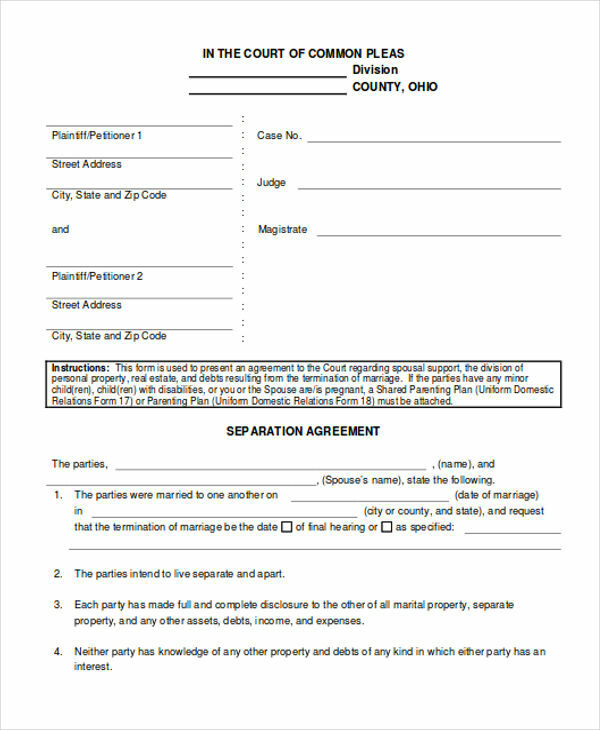 If you and your partner have a prenuptial agreement form before you got married, it would be a good reference for establishing responsibilities and duties once separation is encountered. Your local court will probably have legal agreement templates lying around in case someone would need one. 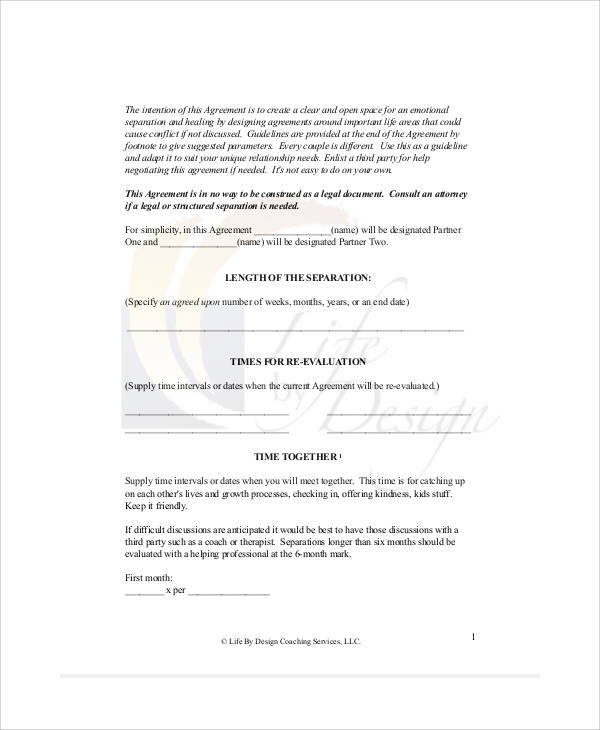 You can also take a look at the free agreement templates that are available and modify it according to your needs and the needs of your partner. 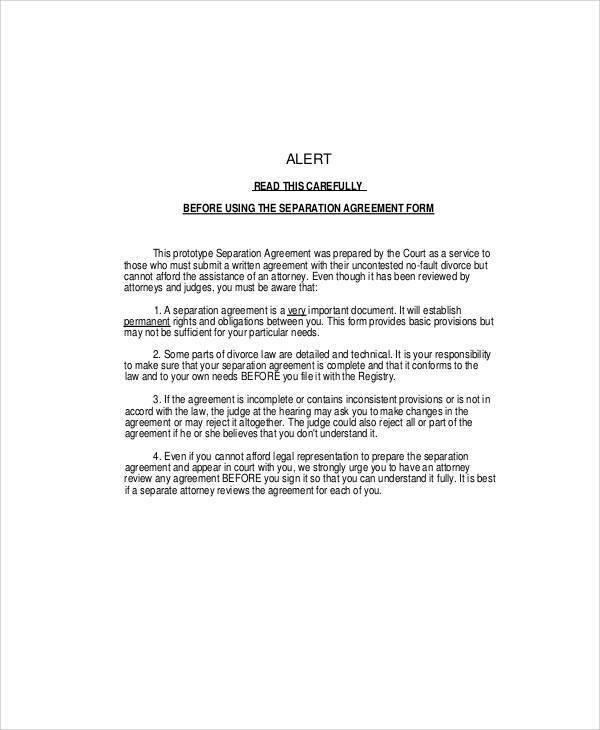 What you will typically find are free agreement forms. 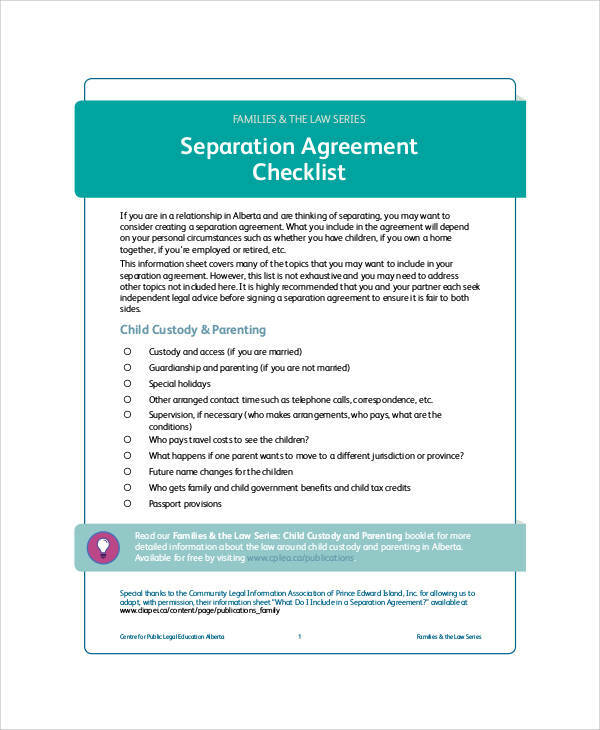 Make sure you fill out the form and make all the necessary edits to match it with separation situation that you and you are going through and have come to an agreement with. You can add a few personal notes or paragraphs should it be deemed necessary. Make sure to provide signature blocks for you and your spouse, as well as the notary lawyer. Before you and your spouse sign the agreement, it would be a good idea to seek the help of a seasoned attorney that handles these matters. The attorney will help you come up with the proper wording and will also help you figure out how to make the agreement fair for both you and your spouse. Leaving a marriage was probably one of the last things that you had in mind when you thought about marrying your spouse. However, certain circumstances will sometimes force you to take the difficult road of separation especially if it is deemed to be for the best.